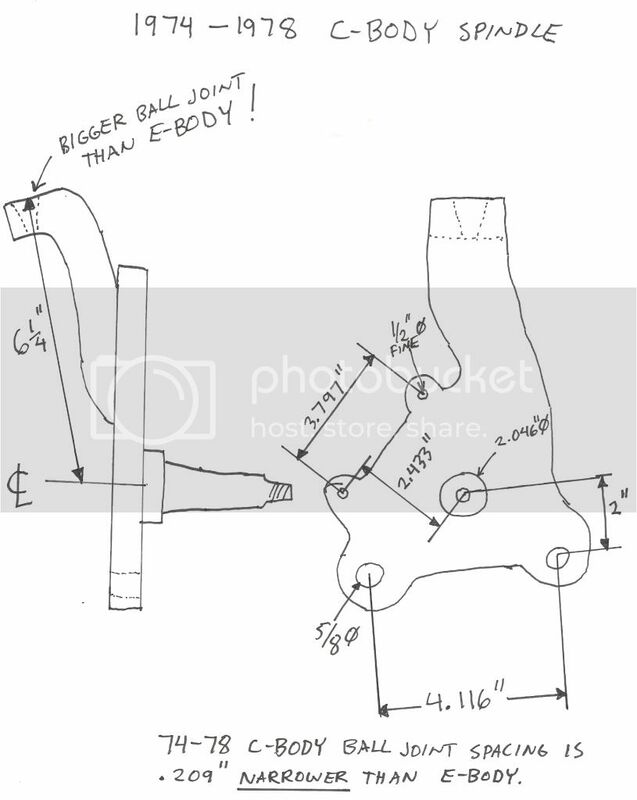 I'm going to modify C-Body spindles to fit on my 1970 Challenger and the stock lower E-Body ball joint. Why, your asking? The C-body uses a thicker rotor that matches perfectly to what the Viper caliper was designed for( so I don't need to install spacers behind the pads), and I can't stand how horribly the car handles now! My 2005 Suburban out handles and out brakes my beloved Challenger , and that just WON'T do! Thanks to member BIGSHCLUNK for getting the spindles for me! I'm wanting my upper control arms to be at a 10 degree angle for the ride height I have chosen,( ball joint higher than the mounts).To lower the roll centers which should make the car handle better( along with a few other improvements I'll be making). Now my upper control arms are level which in my opinion makes the front roll center to high. I'll be using Hotchkis upper control arms, front and rear sway bars and Bilstein RCD shocks. 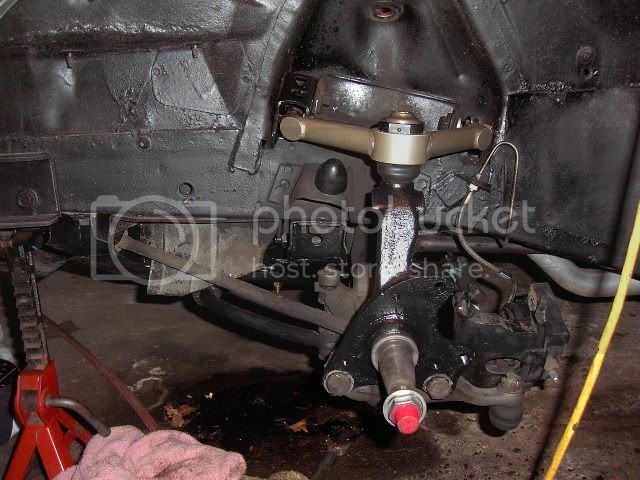 On the Hotchkis upper control arms I have installed Howe ball joints that are 1/2" taller than stock. The years for the spindles to use are either 1974-1978 or 1973 which is a one year only deal. Both of these spindles can be made to work by slightly slotting the lower ball joint mounting holes on a milling machine. I have both spindles to chose from. I'm going to use the 1973 spindle because it uses the same upper ball joint as the e-body and is slightly taller. The 74-78 spindle uses a bigger upper ball joint . 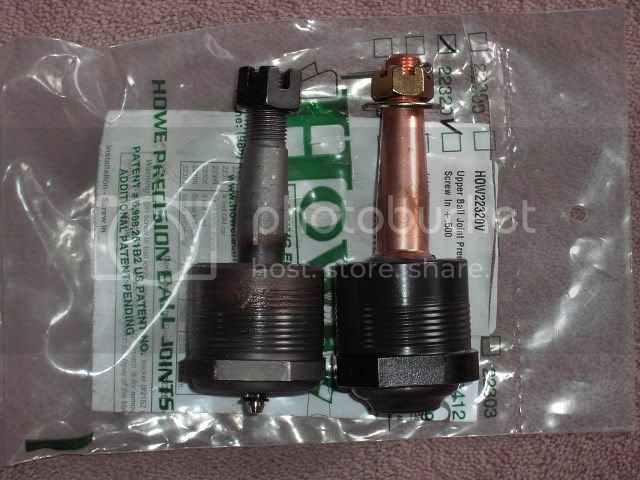 Both C-Body spindles have the pin raised 5/8" which lowers/drops the car 5/8" as compared to the E-Body spindle. Here is a picture of a 73 E-Body spindle and a 73 C-Body spindle, note the C-Body is taller. The 73 E-Body spindle has the caliper bracket for the "big rotor" set up. 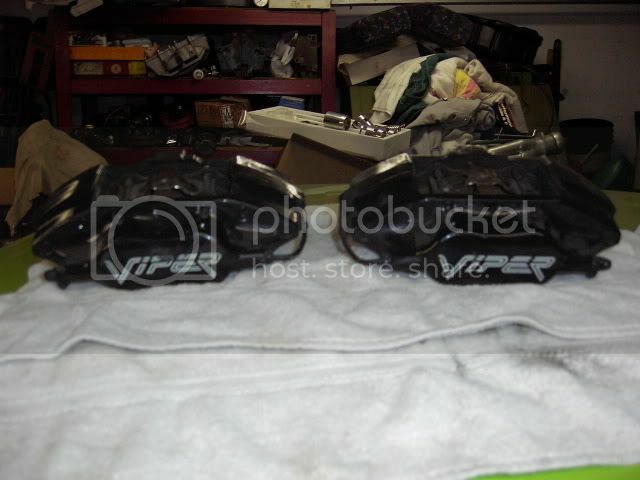 I'm going to make a mount to use the Viper calipers on the C-Body spindle.. Cool idea - is the SAI the same between the E and C body stuff?? I don't know if it matters or not, just wondering. The KPI on the e-body spindle I measured at 5 degrees, on the C-Body I measured it at 7.5 Degrees. To measure it I mounted the spindle pin in the lathe and then used a precision bevel protractor and measured the machined flat surface on the top of the spindle. 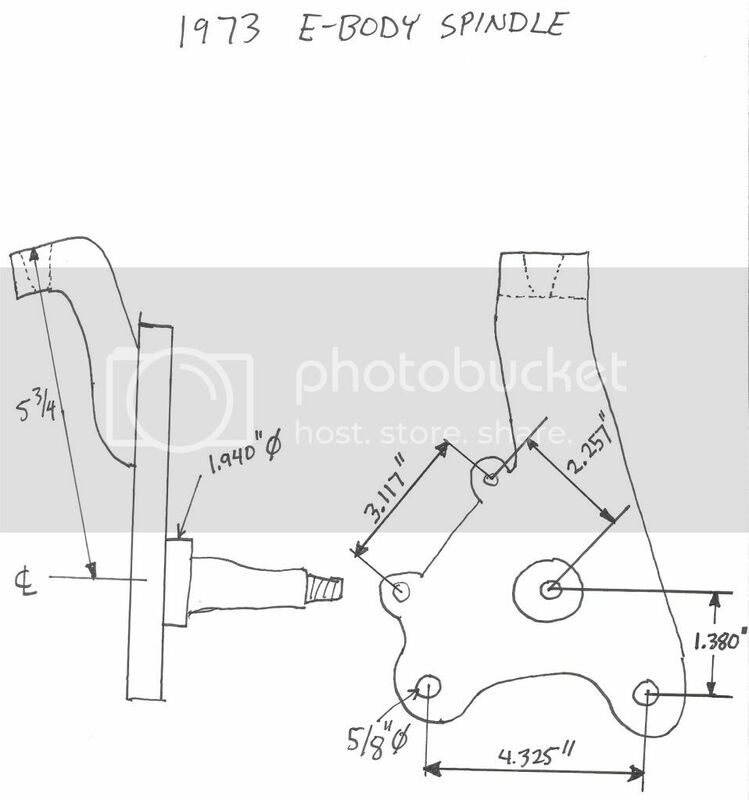 I plan on using A-Body lower control arm as they are supposedly 3/8 to 1/2 longer I'm told? I have a set being shipped. Just waiting for them to arrive. Awesome! I'm watching this one, I'm definitely interested to see what you come up with. The improved SAI will help in return to center manners, so you may only need enough caster for speed stability later on. This is from the 73-76 A-body, which is the same as the 73-74 E-body. is it possible just to use the 73 c body spindel to lower the car. Well, it would lower the car ~5/8". 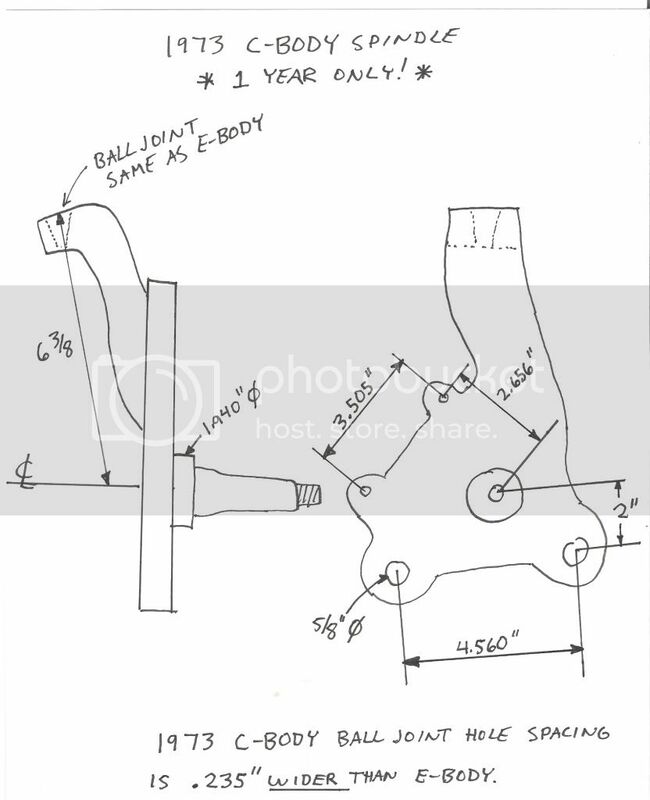 But you'd still have to deal with the lower ball joint being different, as well as use the c-body caliper mount, if I'm following this correctly. It may be a lot of work for 5/8", if that's all you're looking for. Ya it does lower the car 5/8 as compared to the e-body spindle. It wasn't a lot of work though, only took me about 20 minutes to machine both spindles! The 73 C-Body uses a pin type caliper and mount that looks identical to the desired "big rotor set up" except the hole spacing is different. My goal isnt to lower the car so much as to improve the handling by lowering the roll centers( change the angle of the upper control arms), and to get the thicker rotor to match up with the Viper calipers. If anyone on here needs a set machined send them to me and I'll do it for free, just pay the trip? Brad, now I understand where your going with this. Curious as the handling when she's all done! So, what exactly did you do to the spindles? Just drilled the holes for the different caliper mount spacing? Yes , just used a 5/8 end mill and slotted them to the above dimensions.You have to use 73 ONLY spindles though. No you can't use your old rotors or calipers. C-Body uses a bigger bearing and the rotors are thicker( 1 1/4"). I just bought drilled and slotted rotors for my 73 E-Body spindles this summer too. I'm in the process of buying rotors now...again! I'm sure I'll have no trouble selling off the old set up if this works out OK though? I even bought new pads from firm feel...still sitting in the box. 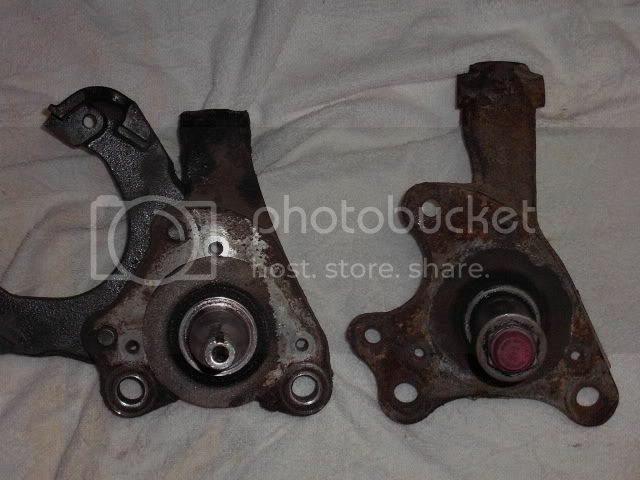 I'm waiting on a set of A-Body LCA's also as they are supposed to be slightly longer? With the KPI being different (and taller) on the C-Body I might need the extra length on the lower to get the camber right? If I were you I'd wait till I get it all assembled and aligned to make sure it all works OK? I was reading in a Mopar suspension book and it said something about T-Bars over 1" should have the hex ends parallel not clocked 30 degs out like stock. Reason being so they don't run out of travel and keep the car to high? This got me to wondering about your set up? Are the ends on your Tbars parallel ? Where did you get them from? Also what about maybe if they are clocked 30 degs maybe they are in the wrong sides? Left to right? Right now I have the C-Body spindle and Hotchkis upper control arm assembled to the E-Body LCA but need a rotor to use my caster camber gauge. Yeah I have every intention of waiting to see what you come up with as a finished product before I mess with the C body spindles. 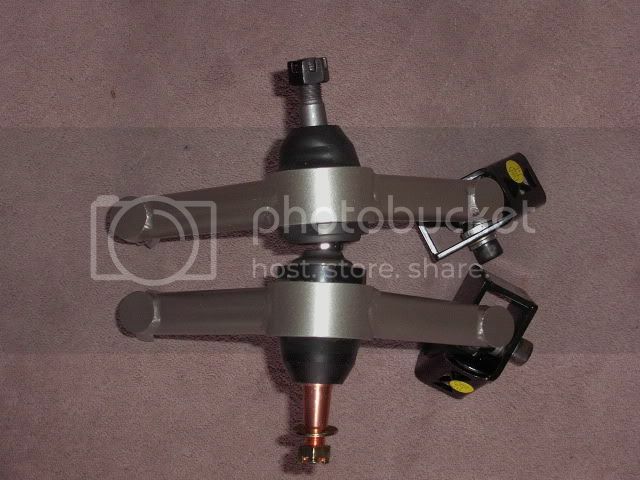 I also think I want to retain my current brake set up, so I'm not sure the spindles are going to be something I use. I may look into the A body LCA's though, since at least in a theoretical set up you want to make the LCA's as long as possible. But as you mentioned, that may cause problems with camber. 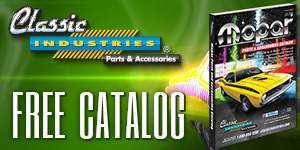 Do you know how much longer the A body LCA's are? Once you have the length it would be pretty easy to figure out the change in camber. I'll find out when I get my new Hotchkis UCA's. I bought a set when Summit had them on sale and I had a discount code, although they're back ordered at the moment. I have subframe connectors to install too, so I'm going to pull the suspension off of it and check the torsion bars. 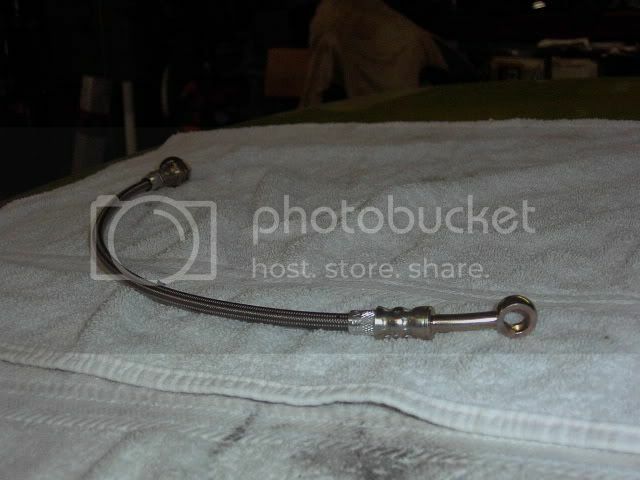 I may also clock the torsion bar anchors 30 degrees to give me a zero offset and return to using stock '73 up spindles. Of course, if it turns out I installed my torsion bars backward I probably won't need to clock the anchors.